All screenshots in the review were taken by me. 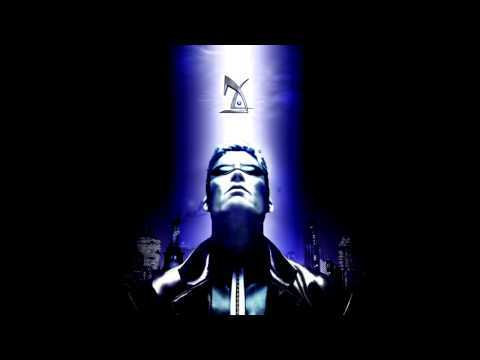 Deus Ex’s story is the game’s strongest point (although the soundtrack comes close). Putting the “absolute power corrupts absolutely” empirically proven fact as its foundation, Deus Ex builds up beautifully from there. JC Denton and his brother Paul before him are the fruits of an expensive, scientific boundary-pushing project led by the UN, aimed at creating a cybernetically enhanced breed of soldiers who would preserve the peace and fight terrorism under UN’s watch… Or at least that’s what JC was taught – before he was sent into action and saw how different reality was from those tales. It doesn’t take the player very long to realise that things are far from what they seem, and that these “terrorists” you’re fighting have a pretty reasonable cause and solid core beliefs. As the game goes on, more and more of the UN’s actual purposes are revealed, making it harder and harder to follow the orders you’re given. 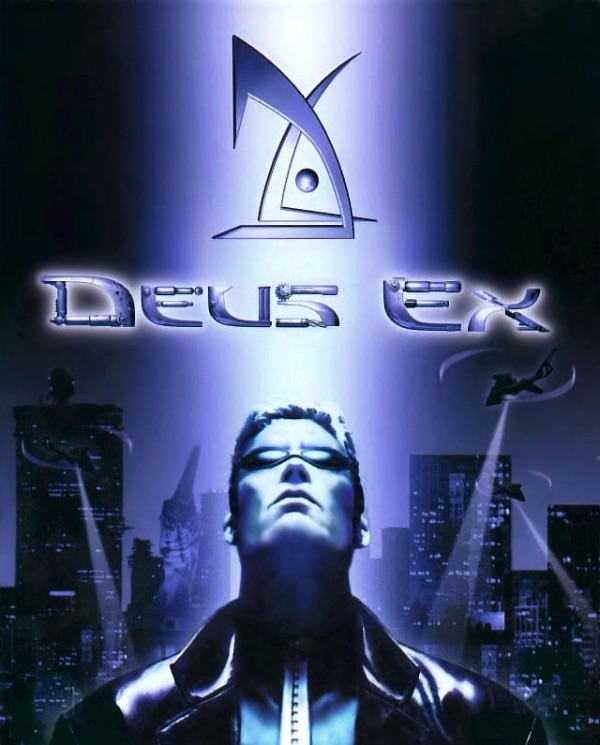 A mere year later, no doubt Deus Ex would not have been allowed to come out without major modifications. 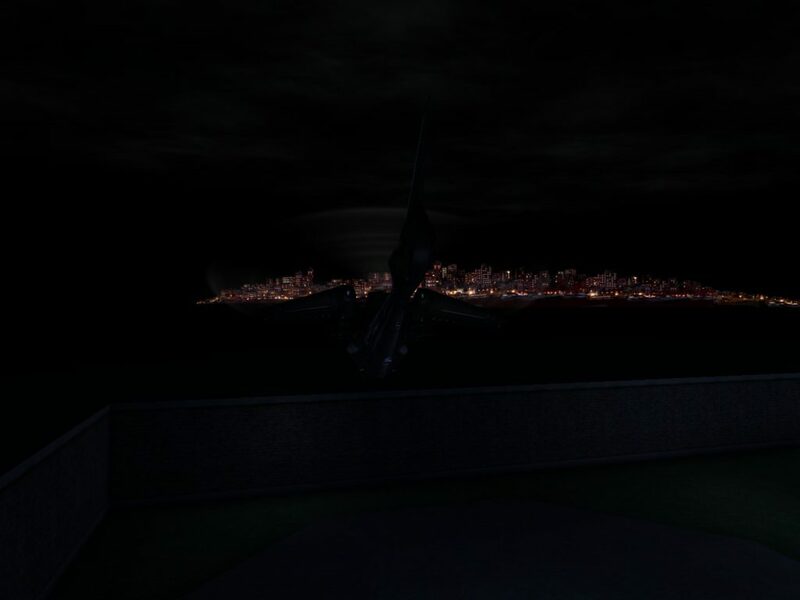 After all, it featured, in the opening level, no less, a terrorist act against one of the New York City landmarks, the Statue of Liberty. However, the game was completed before those fateful events, and could thus exist censorship-free. 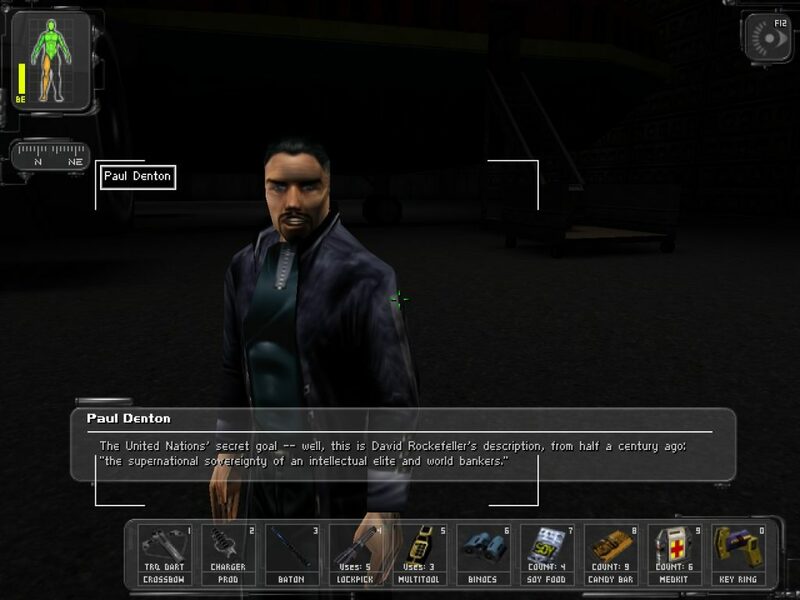 Deus Ex’s gameplay works well for the most part. You’ve got a first-person game with real-time fighting, but also some fine Western RPG elements like building JC’s skills in the way you like. You can make him a battle machine capable of taking out enemies with ease, you could go for the silent, stealth approach (my favourite), or you could choose a middle ground. 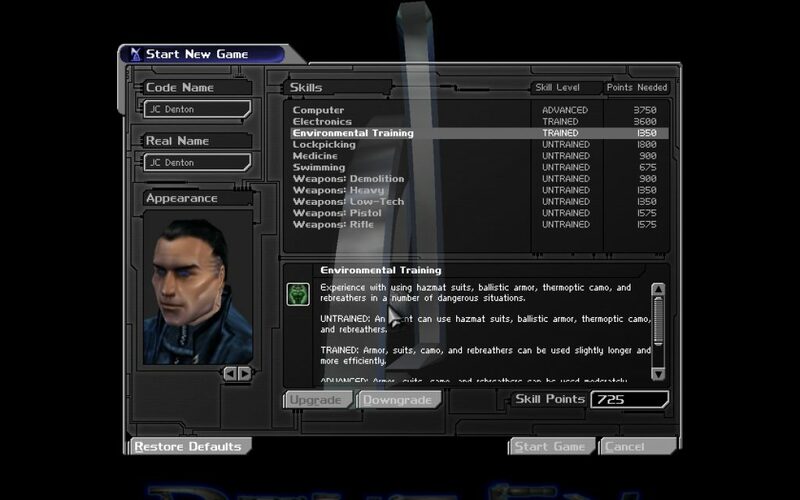 There are points you can distribute among the different skills before you even start the game, but they don’t amount to much – you’ll earn far more as the adventure goes on and you clear missions, or even just when you reach certain locations while exploring – even if they’re out of the mission’s regular path. Your curiosity often gets rewarded. 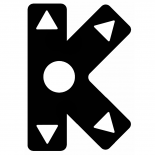 The skills I chose to invest in were Computers (allowing you to hack computers more easily), Electronics (allowing you to disable security) and Lockpicking (self-explanatory). Mostly, that affected the speed with which you took care of those obstacles… Which made me think that it’d be possible to go through the game without upgrading anything whatsoever, although it’d be a bit more of a hassle. By the end of the game, I had so many lockpicks and multitools (which you use to disable security), that I could get past even if I’d been several levels lower on those skills. Shooting and fighting itself is just fine for a 2000 game, but naturally it feels a bit aged today. Still, it’s preferable to the dumbass cover system that’s prevalent now. You heal with medkits, and when you run out of them, you’re screwed. You can’t just hide and automatically fully recover. One aspect where the game designers were off the mark is the tranquiliser mechanics… It’s really a great idea that you are able to incapacitate your enemies without killing them – that’s how I beat the game (although there are a couple of bosses you can’t get past without killing them). However, the way the enemies react after being hit by a tranquiliser dart, i.e. running around until the tranquiliser finally takes effect and they suddenly drop down on the floor, looks silly. 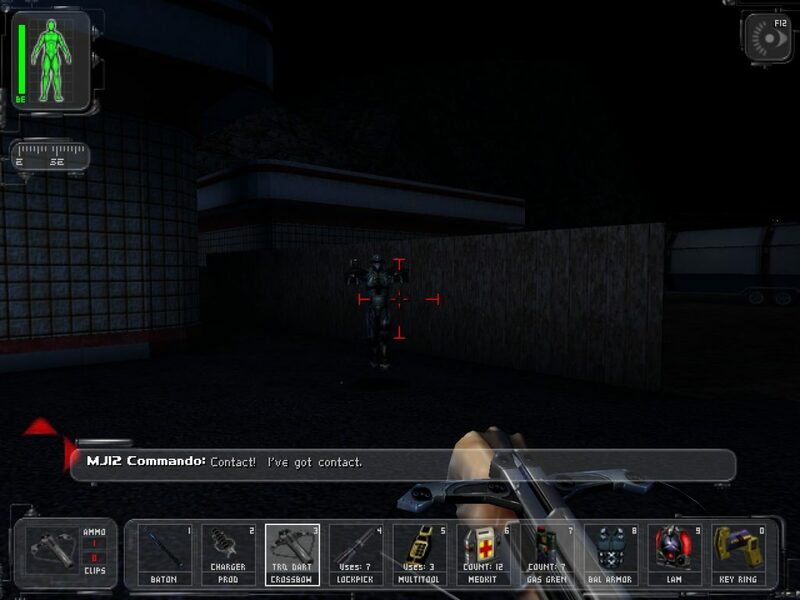 Metal Gear does this better – but then again, Sons of Liberty came out one year after Deus Ex, and it’s not unlikely that the very idea of tranquiliser weapons in Metal Gear was inspired by Deus Ex. But Kojima, of course, did it better. In general, the game is easy to understand and follow – you’ve got primary and secondary objectives, and upon achieving the primary ones, you proceed to the next mission. Except for one or two odd occasions, it’s always very clear what you need to do next, and where you need to go. You’ve got a certain amount of space in the inventory, and you’ll be throwing out items you don’t need to make space for more useful ones. There are some nice things to be found like Ballistic Armour and even Thermoptic Camo (which lasts for just a few seconds, allowing for game balance). Boss battles, as a whole, are interesting because with the right weapon, sometimes you can take out bosses in one or two hits… But a prevalent theme is that you need to attack first, and attack hard – if you get on the defensive, bosses often shower you with their firepower and it’s much harder to fight back. 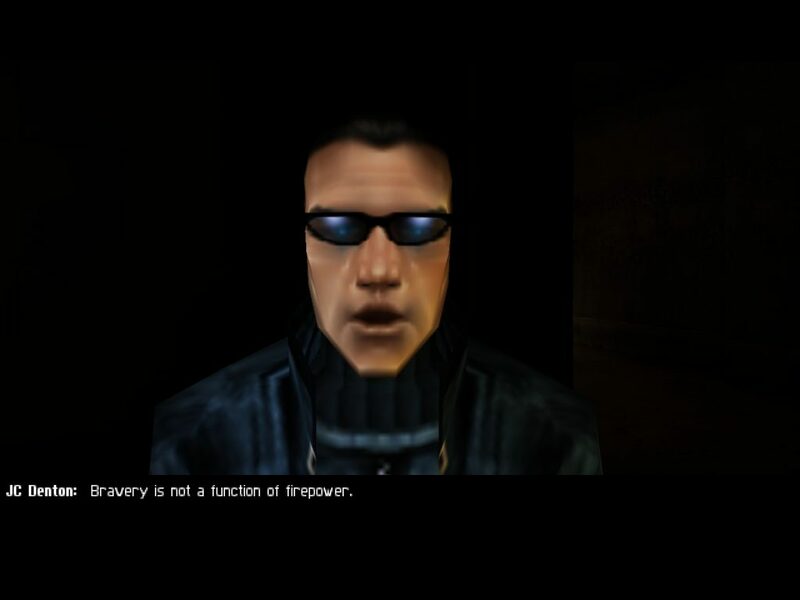 Importantly, Deus Ex offers the player important choices that change the story. While the level of control over the entire story and its outcome that you’re given is not quite on the level of, say, Tactics Ogre, it is still very impressive. There are several possible – and distinct (hello Mass Effect 3) – endings. 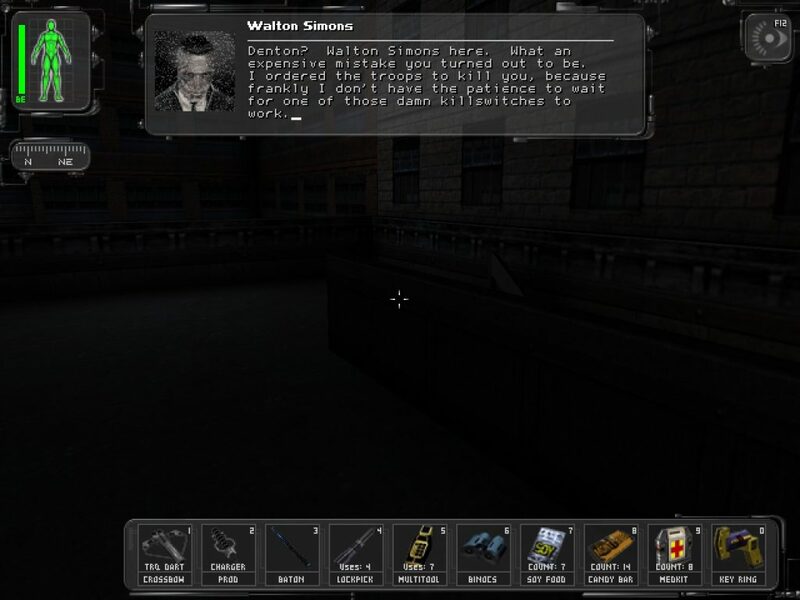 Visually, Deus Ex fails to impress even when we consider its age… JC and Paul’s character models are pretty cool, as are Walton Simons and Bob Page, but that’s about it. Even those basically reuse the same model with some differences, and female character models are notably bad. The environments, especially city environments, are quite bland, too. It’s hard to tell New York from Paris. Hong Kong is more distinct, however. The most interesting environments are inside labs and the like. That said, the level design itself is good, especially indoors. But that’s to be expected from a game from that age. The prettiest sights in the game are, I suppose, when you fly off to the next level on Jock’s helicopter. The soundtrack, however, is something else! It’s one of the best game soundtracks, period. There were so many awesome tunes, I lost count halfway through the game. The genre is hard to nail down, “futuristic” would be the most accurate description, and it fits the game well. Alexander Brandon was the main man behind the soundtrack, with Michiel van den Bos and Dan Gardopee also contributing. Brandon also wrote my favourite theme which I’ll feature here – “Versalife” which plays in one of the most interesting locations JC visits in the game. 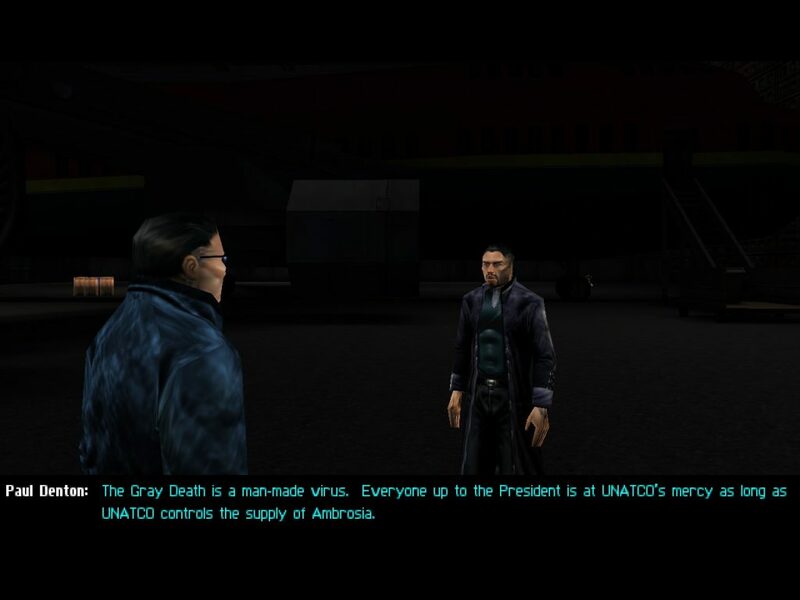 18 years later, it could not be clearer that Deus Ex was right. Powerful and wealthy people would happily sacrifice the rest of the world for their own selfish purposes, and the seemingly benevolent UN bureaucracy is little more than their overreaching tool, seeking to reshape the world in the way the masters desire. Politicians, even the President of the USA, are nothing but figureheads with no real power – weak lines of defence against the above at best; their puppets usually. There is no UNATCO yet, but it’s clear things would have gone that way if globalism had been allowed to run unchecked. 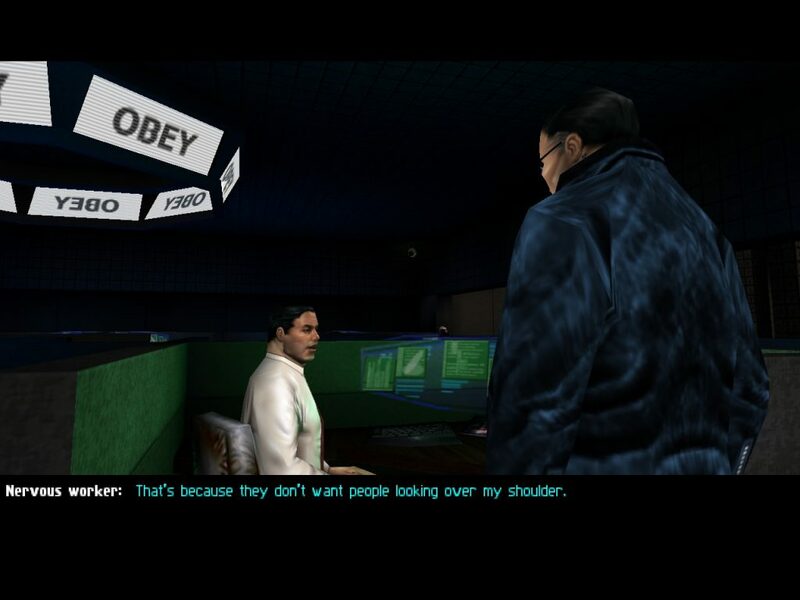 Fortunately, thanks to the internet, people are waking up and none of that will be allowed to happen… And Deus Ex itself was one of the first beacons of warning.